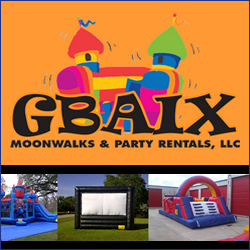 We are Houston’s one stop source for moonwalks, waterslides, interactives, tents, tables, chairs, and other party rentals. We serve the Houston and surrounding area including, League City, Friendswood, Clear Lake, Pearland, Alvin, Pasadena, South Houston, Missouri City, Texas City, Hitchcock, and many others. We also offer themed moonwalks and carnival games.